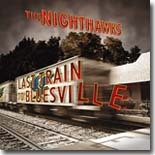 The Nighthawks go acoustic on their newest, Last Train To Bluesville. It's so good that it was an easy choice to be our Pick Hit for the month. Texas-born Steve Howell releases another fine country blues CD, Since I Saw You Last. It made such an impression that two of our reviewers covered it this month. You can find both reviews in our Surprise feature page. This month's Flashback takes a look at the Black Top album, Full Gain, from Grady Gaines and the Texas Upsetters. Our What's New section features new releases from Chris Smither, The Sojourners, Hollywood Blue Flames, Keb' Mo', Nick Curran, The Real Stormin' Norman, Tim Lothar & Peter Nande, and more, plus a 1997 live CD/DVD from Luther Allison.